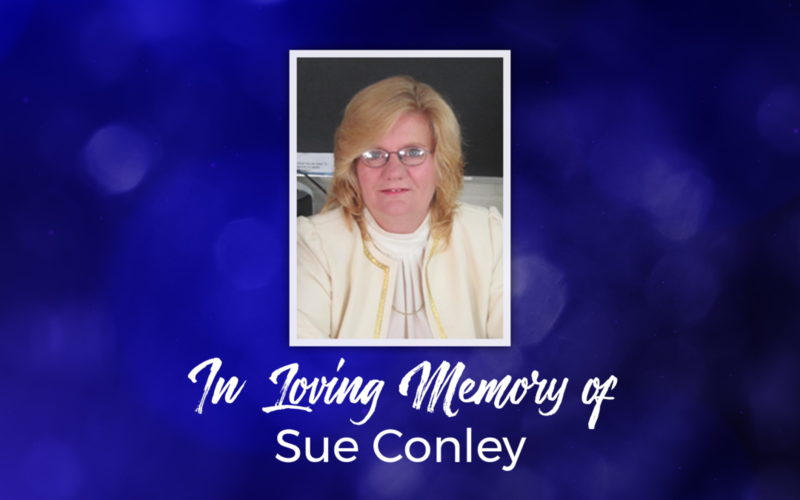 We extend our sympathy to Leon Conley & family following the passing of Sue Conley on Friday, November 24th. Susan Victoria Myers Conley, 61, entered into eternal rest on Friday, November 24, 2017 at her home. Born on August 25, 1956 in York, she was the daughter of the late Robert Myers and Dorothy (Strausbaugh) Rice. Susan is survived by her husband of 42 years, Leon Conley; their four sons, Michael, James, Christopher and wife, Jamie, Jonathan and wife, Kim; seven grandchildren, Lauren, Sarah, Dylan, Logan, Aliya, Brockington and Raelynn; sisters, Kathi Myers, Wendy Wills, Victoria Rice, Samantha Myers; brother, Steve Myers; and many nieces and nephews. She was preceded in death by her parents; as well as her sister, Stephanie; and brother, Scott. Susan was a graduate of York County School of Technology with a degree in Cosmetology. She was a small beauty salon owner and stay-at-home mom. She took pride in being a homemaker and home schooling all of her boys. Her pride and joy was her children, her grandchildren and being a dedicated member and mentor at Dover Assembly of God. A service will be held at Dover Assembly of God, 4790 Carlisle Rd, Dover, on Thursday November 30, 2017 at 11 a.m., with visitation starting at 10 a.m.. In lieu of flowers, contributions may be made to AseraCare-York, 984 Locks Rd. Suite 1, York, PA 17404 or , 4600 Jonestown Rd, Harrisburg, PA 17109. We invite you to use the comments section below to share your memories of Sue, as well as any messages you’d like to pass along to the family.